Check out the Día De Los Muertos art project I designed for Spanglish Baby, a wonderful blog dedicated to raising bicultural and bilingual children. I wanted to create a project that would inspire family togetherness, cross-generational dialogue, and communal interaction. A project where the process through which the work was produced, becomes an integral part of of the work itself. 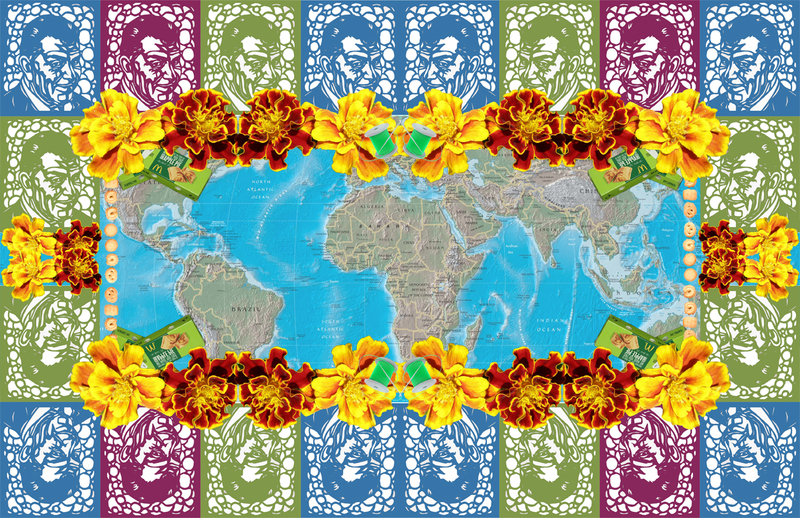 So, I came up with Día De Los Muertos Individuales- functional collaged placemats, modeled after altares, that can be used inside and outside. The image below is of the Individual I made in honor of my abuelita. Visit the project on Spanglish Baby and on YouTube. And if you decide to make an Individual, PLEASE send me pics! I can’t wait to see what everyone comes up with. Your video blew my mind! Thanks so much for the heart and sweat you put into it. It’s very special. You are currently reading Día De Los Muertos Individuales at Maya Talk.